Colombia said Thursday that mass migration from Venezuela has gone down, but the numbers show a different reality. Illegal migration adds to the chaos. “The arrival of Venezuelans to the country will be controlled, orderly and should be done within the limits of the law,” President Juan Manuel Santos said two weeks ago when new border measures were announced. Imposing order in the traditionally lawless border region is a challenge though. Migration authorities are struggling to make sense of the staggering numbers of Venezuelans that cross the border each day. If the authorities’ numbers are to be trusted, they would imply that the number of registered migrants entering daily increased by 30% in January and that the measures announced two weeks ago returned them to the levels registered in 2017. But also these numbers have been changing from month to month and are not counting illegal migration along the 1,370-mile border. In May last year, Spanish newspaper El Pais reported that 55,000 Venezuelans were entering Colombia on a daily basis after an interview with Kruger. What Colombia’s migration office cannot count is the massive number of Venezuelans that enter Colombia away from the official border crossings. Officials in Paraguachon, a town in the northern Guajira province, told news agency Reuters that smugglers in that area alone are smuggling 4,000 illegal immigrants every day. An unknown number of Colombians are also presumed to be returning from Venezuela, but are left out of the migration statistics entirely. 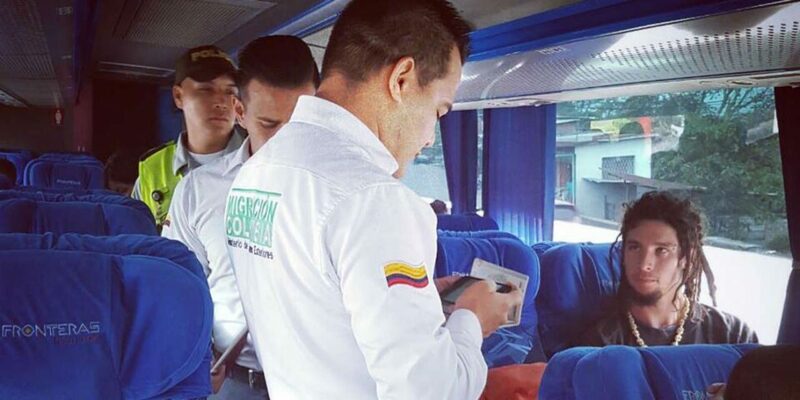 Illegal migrants that have been appearing in almost all Colombian cities are also kept out of the books. Authorities say that 95,000 Venezuelan’s have signed up for the free “Special Permit to Stay” (PEP) which was extended to all Venezuelans who migrated to Colombia legally before February 2 when stricter rules took force. That means that tens of thousands remain in the country illegally after the maximum 180 days on a tourist visa ends. More than 550,000 Venezuelans live in Colombia according to migration authorities. Some analysts believe that number will grow to 1 million in 2018. “We don’t want to impede the migratory flow, but we want it done in an orderly manner,” Kruger told news agency Reuters in a telephone interview on Friday. His agency, however, is overmanned by the mass exodus.